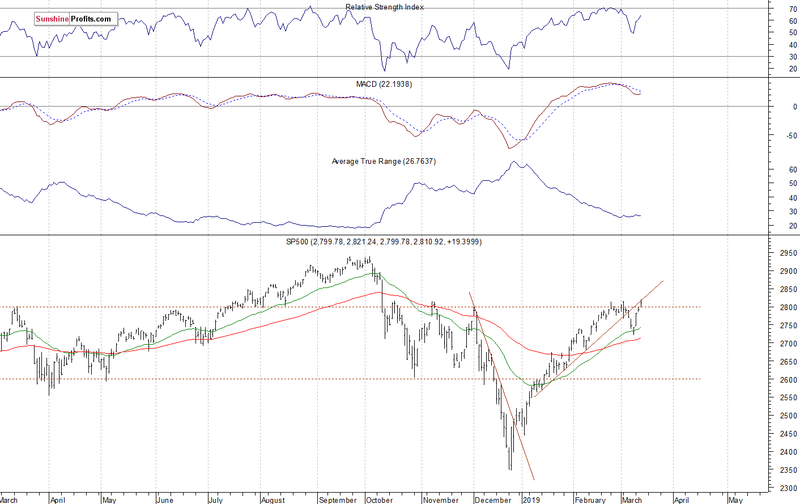 S&P 500's New Medium-Term High, but Will Uptrend Continue? Stocks extended their uptrend on Wednesday, as investors' sentiment remained bullish following the recent advances. The S&P 500 index was the highest since the early October yesterday. 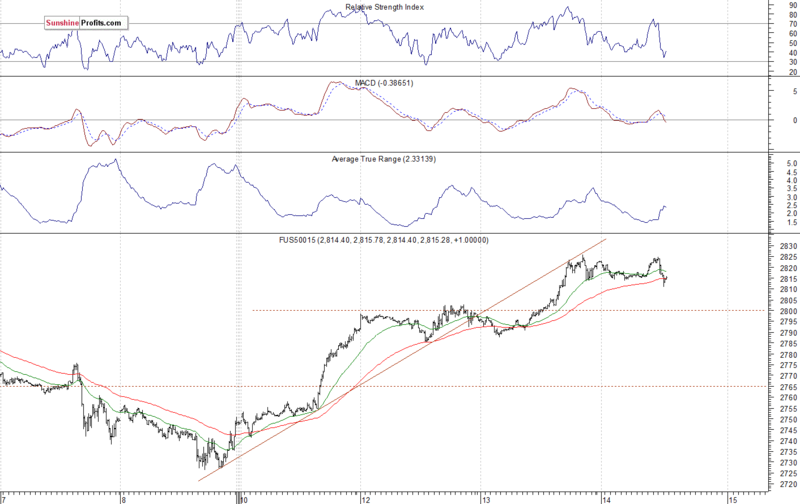 But will the rally continue despite some short-term technical overbought conditions? The U.S. stock market indexes gained 0.6-0.7% on Wednesday, as investors' sentiment remained bullish. The S&P 500 index retraced more of its October-December downward correction of 20.2% yesterday. The market is now close to the previous medium-term local highs following an intraday rally to the new medium-term high of 2,821.24. The broad stock market's gauge is now just 4.4% below September the 21st record high of 2,940.91. 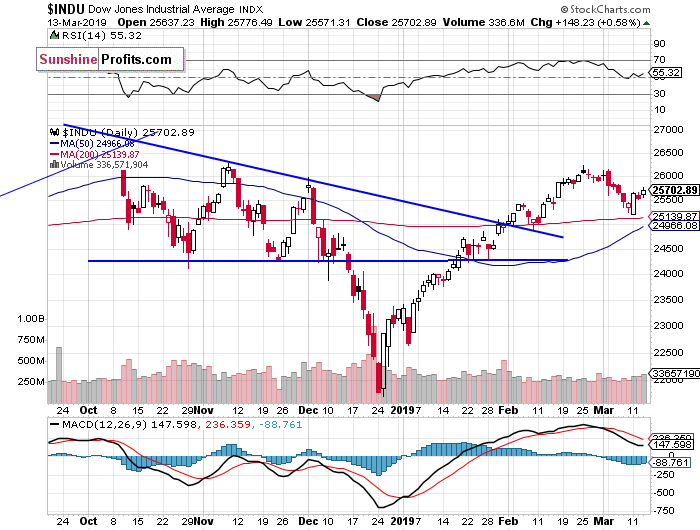 The Dow Jones Industrial Average gained 0.6% and the Nasdaq Composite gained 0.7% on Wednesday. The nearest important resistance level of the S&P 500 index is at around 2,815-2,820, marked by the medium-term local highs. On the other hand, the support level is now at 2,795-2,800, marked by the yesterday's daily gap up of 2,798.32-2,799.78. 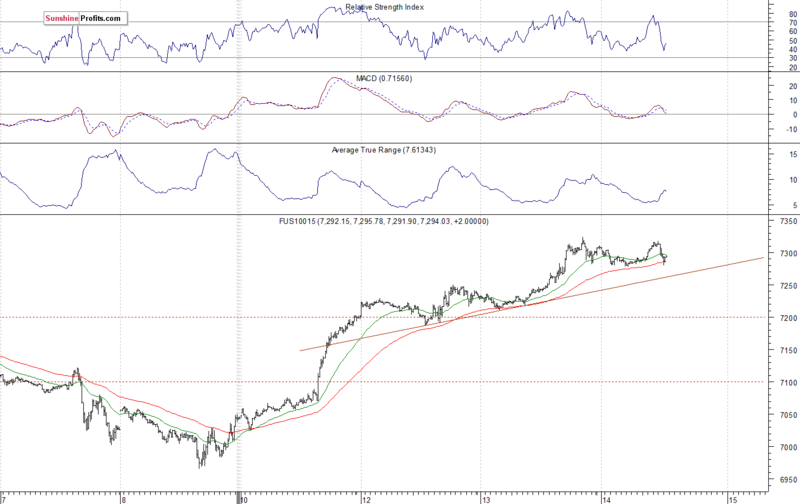 The support level is also at 2,785, marked by the Tuesday's daily gap up of 2,784.00-2,786.73. Expectations before the opening of today's trading session are slightly negative, because the index futures contracts trade 0.1-0.2% below their Wednesday's closing prices. The European stock market indexes have been mixed so far. Investors will wait for some economic data announcements today: Initial Claims at 8:30 a.m., New Home Sales at 10:00 a.m. 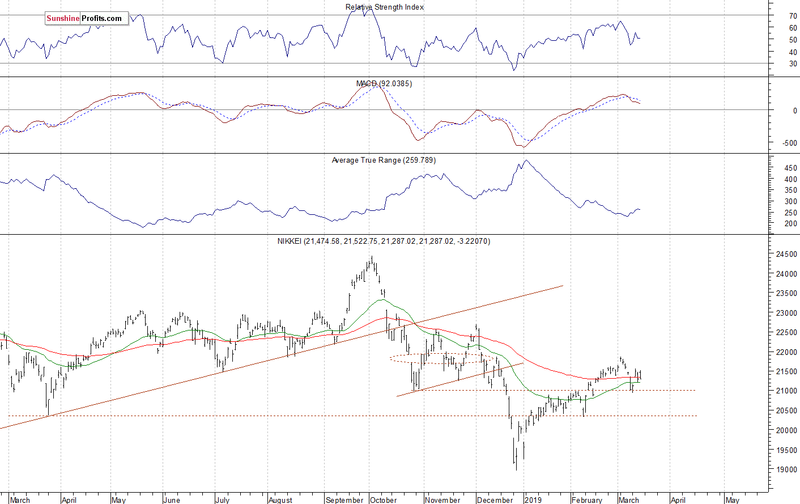 The broad stock market will likely retrace some of its recent rally. We may see some short-term uncertainty. However, there have been no confirmed negative signals so far. The S&P 500 index extended its recent run-up yesterday, as it got the highest since October the 10th before slightly retracing the intraday rally. 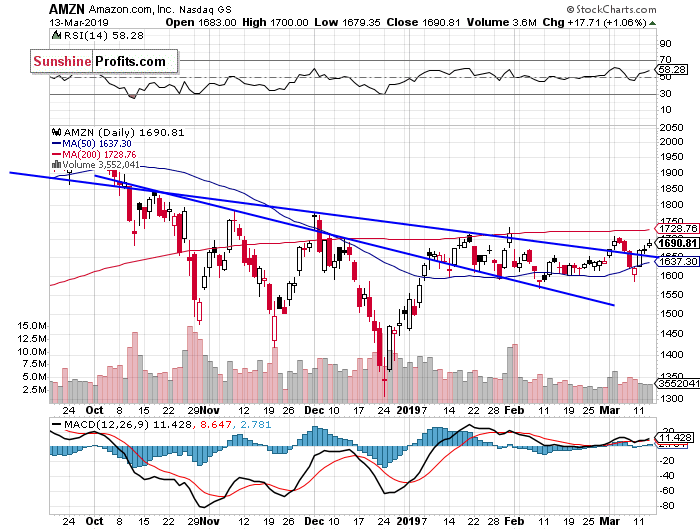 The market came back to the previously broken two-month-long upward trend line. So will it act as a resistance level? We could see some short-term uncertainty, as stocks reach their previous medium-term highs. Concluding, the S&P 500 index will likely open slightly lower today. 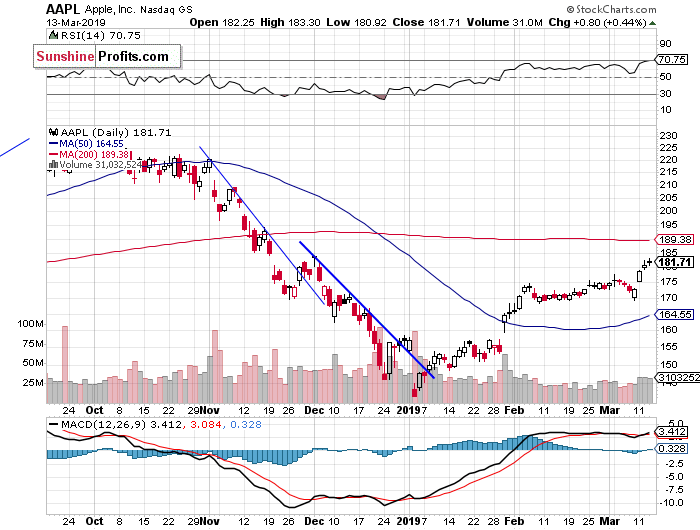 We may see some short-term fluctuations following the recent rally. There have been no confirmed negative signals so far.